Finally, social scientists have begun to attempt to understand religious behavior rather than to discredit it as irrational, ignorant, or foolish—and Rodney Stark and Roger Finke have played a major role in this new approach. 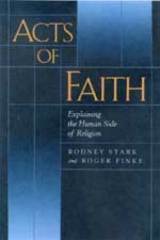 Acknowledging that science cannot assess the supernatural side of religion (and therefore should not claim to do so), Stark and Finke analyze the observable, human side of faith. In clear and engaging prose, the authors combine explicit theorizing with animated discussions as they move from considering the religiousness of individuals to the dynamics of religious groups and then to the religious workings of entire societies as religious groups contend for support. The result is a comprehensive new paradigm for the social-scientific study of religion. Rodney Stark is Professor of Sociology and Comparative Religion at the University of Washington. Among his many books are The Rise of Christianity (1996), The Future of Religion: Secularization, Revival, and Cult Formation (California, 1985), and, with Roger Finke, The Churching of America, 1776-1990: Winners and Losers in Our Religious Economy (1992). Roger Finke is Professor of Sociology at Pennsylvania State University.